Rectangular Nozzle Loc-Line Kit. 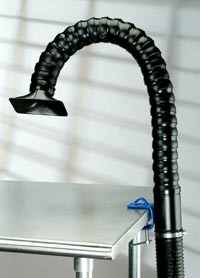 Smoke and fume extraction duct configuration with rectangular nozzle. NOTE: Fume extraction unit (HJ3100 or FA-430) NOT included with kit. The Hakko Neoprene duct (999-189) that comes with the Hakko Loc-Line duct kits (999-205-01, 999-205-02, 999-205-01B and 999-205-02B) will fit on the Hakko FA-430 fume extraction unit with the Hakko B3621 adapter.